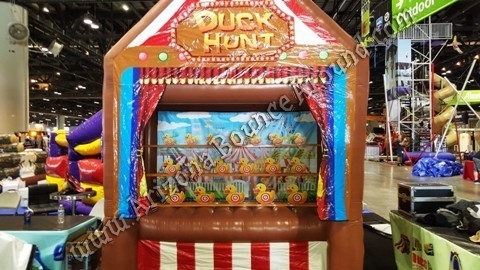 Our Giant Duck Hunt Carnival game is 10 feet wide and 15 feet tall and features 3 rows of ducks to knock down. It comes complete with giant inflatable tent tat looks amazing, 2 air guns with foam safety balls and skirted table in front to hold the guns. We can also provide this game with bean bags or tennis balls if you prefer. 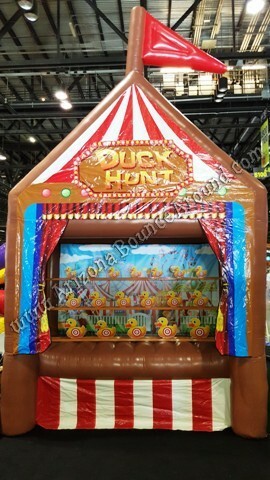 We will be adding several new games like this one so stay tuned for more giant carnival games posted soon.